It is not often I feel so strongly about something that I am willing to stick my neck out there. Especially, when I live in an area so highly populated with others having an ax to grind. For nearly the last month, we've all watched the coverage of the Occupy Wall Street protests on the news, on twitter, and all the social networking sites. Many people have taken sides on the issue, and it appears, battle lines are being drawn. New Occupy (insert location here) protests have since sprung up in many major cities throughout our great United States. But, what is this movement (or revolution, as some see it) all about? The motto that those within this movement chose to adopt is: We are the 99%. What, exactly do these protesters mean by this? Basically, the top 1% of our nation's population accounts for 22.8% of earned income wages for the entire nation. The other 99% account for the other 78% of wages earned. This is where I begin to rant. First off, this top 1% are those citizens with more than $410,000.00 of annual income shown on their taxes. Here's the kicker. This 1% accounts for more than 40% of all income taxes paid. Nearly 50% of our country's citizens pay no taxes. That's right, this top 1%, or those folks we like to call rich people, provide nearly half the revenues to our government in annual income taxes. The next issue I have with this movement is that they do not seem to have any solid reasoning for demonstrating outside of wanting further wealth redistribution. In other words, the bulk of their demands include having their student loans paid, and extending social programs without expectation of employment. I've seen countless websites comparing the Occupy Wall Street movement with the Tea Party movement. This implies that this movement has some political basis. While I do wish the Tea Party movement would apply more to all political parties, it remains a generally conservative movement, which limits its affect to Republicans. Those participating in the Occupy Wall Street movement seem to want increased social programs and government intervention that might take from those dirty rich folks and provide better for the poor. Now, let me ask you one question. If our government increases taxes on the rich to the point they are no longer rich, who will provide the government with 40% of their revenues? Will it be the middle class, who currently make up the bulk of the remaining 60% of revenue? Soon they will have nothing left to give, and our government will no longer have the means to provide for the nearly 50% of our population currently not paying taxes. It seems so simple, but there are so many that have succumbed to this society of entitlement we've created for ourselves. 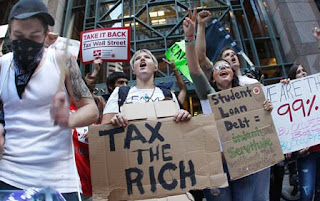 One of the things those in the Occupy Wall Street movement have right, is their anger at Wall Street, or rather, some of the corrupt CEO's and other business leaders that used taxpayer money for their retirement pensions and lavish vacations, while their businesses crumbled around them. Many of those within the movement argue that none of those business leaders find themselves in jail, while protesters are being hauled off to the hoos cow by the hundreds. To that I must unfortunately say, those CEO's did not break the law. What they've done may be immoral, but it was not illegal. These business people simply took the money given to them by the United States Government, and used it as they saw fit. The Government gave no mandate with the billions they gave away. That, my friends, is exactly why Government should not venture into the business of saving businesses. Government is Government: Business is Business. The two have always been, and will always be, like oil and water. These businesses did exactly the same thing that most Americans did. Remember that stimulus given to Joe taxpayer recently? I might ask, how many of you that received this money used this money to boost our economy? How many of you, instead, used it to pay bills, or saved it because of future uncertainty? How many of you gave that money back to the Government? I didn't think so. Yet these are the same people that now occupy the streets of our cities with the strong mandate that our Government should give them more. America was founded on principles of religious and economic freedom. Our forefathers gave their blood - their lives to free our colonists from Government oppression. Now, those marching in the streets are asking for it, oppression, I mean. Of course, you must understand that I see many of our social programs such as welfare, as a form of oppression. The reasoning? Shortly after a person finds themself in need of one of these programs, they often realize that it has become economically unwise to actually find work for fear of suddenly losing all the benefits they are currently receiving. One of the many flaws of these programs is that it is a kind of all or nothing system. If a person finds work, their benefits are suddenly cut, and they are forced to either remain under-employed, or simply quit and go back on subsistence. This is not a problem brought on by the current administration, or something caused by the last administration. All political parties share equally in this blunder. Just like all parties share equally in our immigration problem. But that's another story. Yes, we live in a capitalistic society. Businesses do everything they can to increase profits, while government regulates just how far they can go in pursuit of those profits. That's the way it works. That rich guy in your town is not some evildoer. That rich person is someone who is likely paying more than their fair share of taxes (read your taxes) providing you with a job, and supporting our government. Let me leave with this. Many say that the Occupy Wall Street movement is grass roots, with no leader. In fact, this movement was propagated by a Canadian organization that is anti-capitalism and publishes a magazine called Adbusters. Think about that. This entire movement was spawned from a foreign country with a desire to reduce capitalism and increase socialism. Interesting reading. Thank you for your insight. Thanks for your comment. It feels good to be told I provided some insight. There are some that are only accusing me of providing "insite" to the issue.